According to page 8 of the CAB report, the Distance Measuring Equipment (DME), as recovered, was tuned to the Knoxville VORTAC with the mileage module locked at 47.5 miles. The crash site, according to page 3 of the same report, is described as being 41 nautical miles east northeast of the Knoxville VORTAC. Thus, a 6.5 mile discrepancy that we will discuss later. The CAB report states, “The #1 VOR navigation receiver was tuned to the Knoxville VORTAC.” When the #1 VOR Receiver is set on a VORTAC station, DME is automatically tuned in. 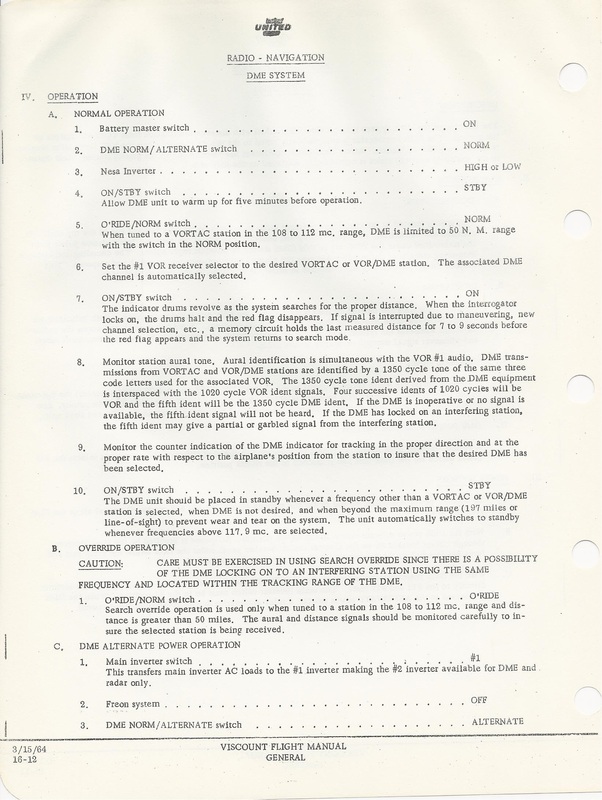 It is important to remember that signals from the Knoxville Vortac were transmitted by VHF equipment. As a result, United 823 had to maintain Line Of Sight with the Knoxville Station in order for the Distance Measuring Equipment to remain functional. If one examines the portion of the Tennessee Aeronautics Chart and locates Bird's Bridge, where Dan Burgner saw the aircraft flying over his parent's house, it can be determined that Captain Sabatke had a clear line of sight to the Knoxville Vortac. The effectiveness of the DME transmitting and receiving signals is, in large part, determined by altitude. The higher the altitude of the aircraft, the greater the likelihood of receiving and transmitting from the VORTAC. Aircraft flying at lower altitudes run a greater risk of losing line of sight-especially in the rough terrain that is found in East Tennessee. It is remarkable that Captain Sabatke was able to maintain line of sight with the Knoxville VORTAC at such low altitudes-which causes one to believe that the aircraft may have been at a slightly higher altitude than reported-at least until the final moments before the crash. 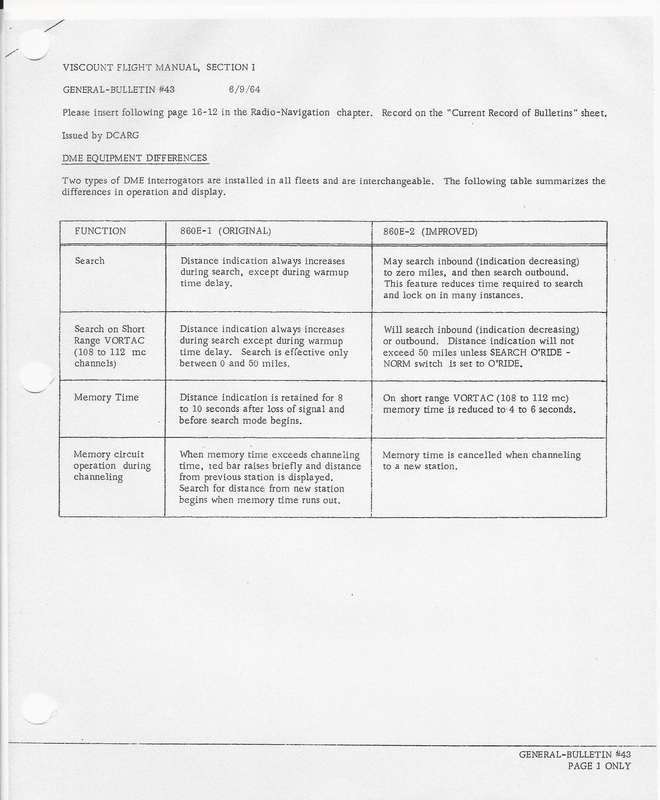 Since there was a discrepancy between when the DME ceased functioning at 47.5 miles from the Knoxville Vortac and the 41 mile distance between the crash site and Knoxville Vortac, it is reasonable to assume that the altitude of the aircraft was such that, a couple of minutes prior to the actual crash, the DME was in “stand-by” mode due to a loss of “line of sight”. Aircraft flying at low altitudes have a slant range (the hypotenuse of a triangle), in nautical miles, roughly equivalent to the ground distance in nautical miles. Since United Flight 823 was flying at low altitudes during its final minutes, “slant range” was not a great factor in determining distance, in my opinion. NESA is the acronym for “Non-Electro-Static Formula A Glass” that was manufactured by Pittsburgh Glass Company. The NESA inverter was originally designed for the heated windshield on Viscount aircraft, but later was to also provide power to the Distance Measuring Equipment after DME became part of Viscount aircraft. 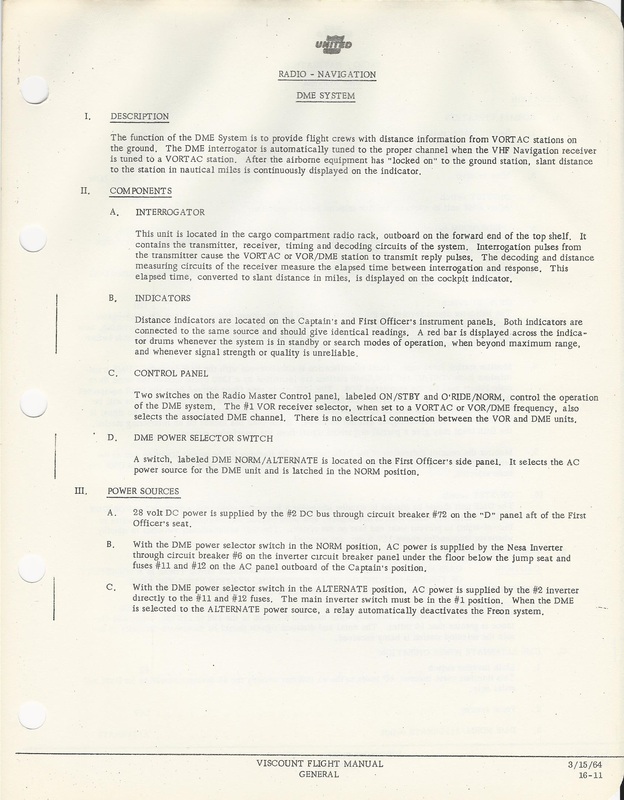 While the CAB report maintains that rotational damage to the NESA Inverter that powers the DME is proof that the inverter was operating at the time of impact, and that electrical failure had not occurred on Flight 823, it should be pointed out that the “fall back”, in the event of NESA failure, is for the Main Inverter switch to be set at #1, Freon System “Off”, and the DME/Transponder switch changed from “normal” to “alternate” - creating a connection between the #2 Inverter and the DME/Transponder. It is possible that the rotational damage to the NESA Inverter was caused by impact, but the question can be raised as to whether or not the DME was powered by the #2 Inverter as a result of NESA Inverter failure at some point prior to the crash. The fact still remains that the DME ceased functioning approximately 6.5 NM prior to the crash. Since it is impossible to know the altitude of the aircraft at that point, it is not possible to calculate the slant range, except to say that it most likely did not differ much from nautical miles on the ground.